Thinking about Summer School? There’s still time to enrol. There are almost 100 undergraduate and postgraduate courses available, ranging from Antarctic studies to engineering and art history to statistics. Summer study is a great way to shorten the time it takes to complete your degree, retake a course, pick up a prerequisite course or spread your workload while still having time to make the most of the long summer days. For everything you need to know including how to enrol, visit the Summer school website. Want to get ahead in your studies? Enrolments are now open for UC’s Summer School courses starting in January 2019. Summer study is a great way to shorten the time it takes to complete your degree, retake a course, pick up a prerequisite course or spread your workload. Check out the range of courses available and enrol today. Get ahead in your studies by taking one of UC’s upcoming Summer School courses. It’s a great way to shorten the time it takes to complete your degree, retake a course, pick up a prerequisite course or spread your workload – and you’ll still have heaps of time to make the most of the long summer days. 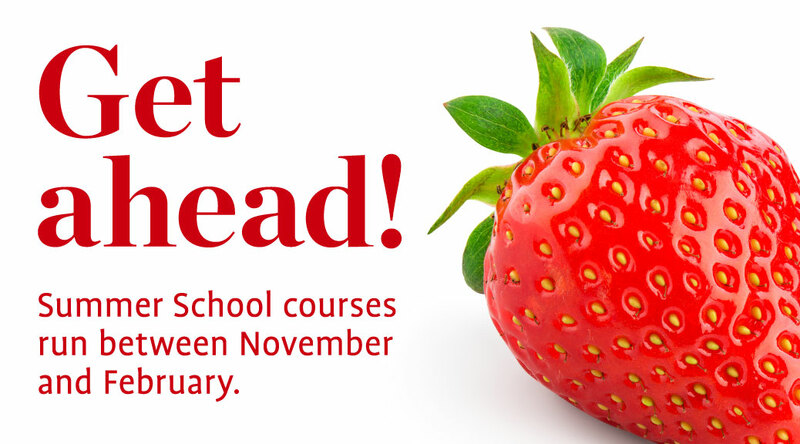 Enrol now for a November start or from 1 October for courses starting in January. Check out the range of courses now.